The second version of Microsoft's Surface Pro tablet offers some good enhancements, primarily to the kickstand and the available accessories. We think it's a great tablet all up, especially if you like the idea of carrying around a fully functional computer in a tablet form factor. There are still some issues regarding its usability and finish. Take the best parts of a tablet and a laptop, join them together, and you’ll probably end up with something similar to the 10.6in Microsoft Surface Pro 2. It has all the features most of us Windows users want under the hood and in the hardware’s design, and Microsoft has even tweaked the original design to make the sequel device a little better overall. However, it still has issues. The main thing to note about the Surface Pro 2 is that it’s a full-blown computer that runs a full version of Windows 8.1 on a screen that has a Full HD resolution. You can use this tablet to run practically any software that you are used to running on your Windows-based desktop or laptop computer — except for many taxing games, though it did record a decent score of 4473 in the 3DMark Cloud Gate test. The model that we tested runs a fourth generation Intel Core i5-4200U CPU, which has two cores, Hyper-Threading, a standard frequency of 1.6GHz, and built-in Intel HD graphics. It’s a CPU that gives the Surface Pro 2 a little more efficiency when it comes to power handling, without sacrificing performance. We also got 4GB of DDR3 SDRAM and a 64GB solid state drive (SSD). What we tested is a base configuration, though, which has a price of $1019. There is also a 128GB version that comes with 4GB of RAM, and there are 256GB and 512GB versions that come with 8GB of RAM. The most you can expect to pay is $2039 (sans options), according to Microsoft’s Web site, and that’s for the 512GB version, which wasn’t in stock at the time of writing. It’s nice to have so much variety regarding storage capacity and RAM for a tablet device, though the CPU and the rest of the configuration stays the same, mainly because the enclosure is designed for a specific thermal output and changing the other components would also require a different enclosure. These specs basically put the Surface Pro 2 on par with a modern Ultrabook computer, and our performance tests bore this out. Our Blender 3D rendering test took just 50sec; our iTunes MP3 encoding test took 58sec; our Handbrake DVD-to-MP4 conversion test took 21min 50sec. The SSD recorded read and write rates of 477.9 megabytes per second (MBps) and 174.3MBps, respectively, in CrystalDiskMark. Compared to one of the thinnest and lightest touchscreen Ultrabooks on the market, Sony’s VAIO Pro 13, which uses the same CPU, the Surface Pro 2 recorded the exact same time in Blender, was two seconds slower in iTunes, faster by about 7min in Handbrake, but slower in the CrystalDiskMark tests. The slower storage performance against the Sony is due to the Sony having a PCI Express based SSD, which offers greater throughput. For whatever you use an Ultrabook, you can also use the Surface Pro 2. The benefit of the Surface Pro 2 is that it has a native tablet design, rather than a clamshell notebook design, which makes it more conducive to touch, and also much more portable (it weighs 914g and is 13mm thick). Because you can get a Type Cover 2 cover for the Surface Pro 2, it can very easily be used as a notebook as well, and we think the Type Cover 2 is as good as many Ultrabook keyboards that we’ve seen, albeit a little more cramped due to the 10.6in size of the tablet. It attaches to the Surface via a powerful magnet — you don’t need to fiddle with it — and you can hold the tablet upside-down via the Type Cover 2 without the two components coming apart. (Don’t shake it in this position, though, because then the Surface could definitely go flying). Type Cover 2 is improved over the first version, and it makes the Surface Pro 2 very comfortable to type on in this type of scenario. Basically, we class the Surface Pro 2 as a hybrid Ultrabook when it’s used with the Type Cover 2, because it’s better than many of the hybrid style Ultrabooks we’ve seen to date, including Acer’s Aspire P3, which attempts to be a similar product to the Surface Pro 2, but it comes off feeling much bulkier and looking less attractive. The way the Type Cover 2 closes over the screen of the tablet makes it neat and convenient to use. You can fold it the other way completely so that you can use the tablet natively without the keyboard getting in the way, and it can even form a base when the kickstand is out. Do this when you want to sit the Surface up to give a presentation or watch a movie. 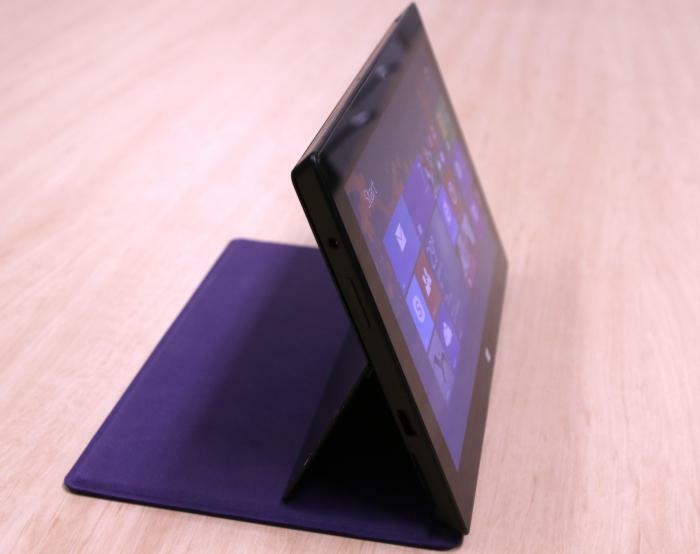 You can fold the Type Cover 2 underneath the tablet so that it acts as a stand. 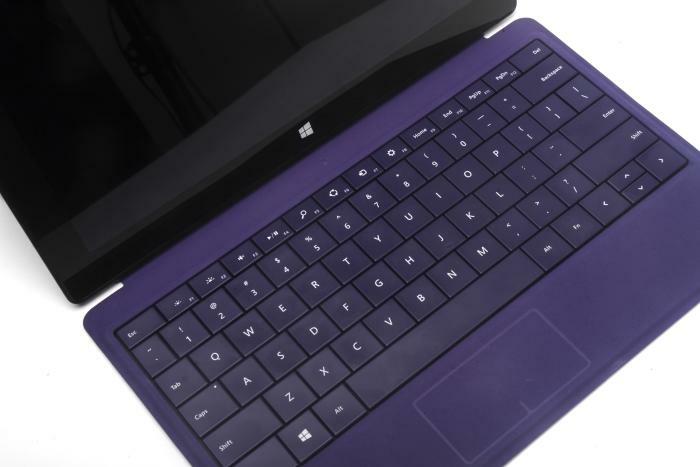 Up to this point, one thing is probably clear: the Surface Pro 2 is a great product when you include the soft, felt-covered Type Cover 2 keyboard cover. The thing is, it’s not standard, so you have to pay extra to get this useful functionality and make the Surface Pro 2 an attractive productivity tool. It sets you back $150, but we think it’s completely worth it. It’s much better than the Touch Cover 2, mainly because it has tactile keys that have a surprisingly good amount of travel and response (the trade-off is a slightly thicker and heavier device when the cover is closed over the tablet). It’s a backlit keyboard, too, and the backlight has three different intensities on offer. The backlight can be enabled and disabled manually, and it’s on a timer. After a short idle time, the backlight will switch off. Magically, it will switch on again when you put your hands close to the keyboard again — you don’t actually have to touch it. The only drawback of the Type Cover 2 is its paltry touchpad, which takes a while to get used to. Its left- and right-click buttons aren’t easy to use without actually looking at the pad to see exactly where you are pressing. Furthermore, the pad doesn’t support right-click-and-drag operations, and double-click-and-drag operations also aren’t doable. You can use two fingers to scroll, but you can’t use three fingers to flick. There aren’t any touchpad settings to play with (none that we could find, anyway), so you’re stuck with the default characteristics of the pad. The keys on the new Type Cover 2 are excellent, but, where possible, use a mouse instead of the touchpad. We could use the Surface Pro 2 with the Type Cover 2 for hours on end without getting tired of typing on it, so we can recommend it to anyone who is a writer and who wants a tablet device rather than a laptop to take on the road. Because it’s very thin, the palm rest being small doesn’t matter too much; you can just rest your hands on the table. The keys are a hair under 18mm wide and the layout isn’t confusing. There’s a Windows key on the left, a Fn key on the right, there are arrow keys (though the up and down keys are half-size), and the Shift keys are of an appropriate size on both sides. Home, End and Page buttons reside at the top, and the F-keys perform brightness, media control, and Windows shortcut tasks as their primary job. Lap usage is still a bit of a struggle with the Surface Pro 2 — much like it was with the original — mainly because the Type Cover 2 can move a little too much as you rest your hands on it, but it’s a definite improvement over the original Surface Pro because the kickstand can now be set to one of two different positions. You can make the screen tilt back a little further, which should make it more comfortable to see, especially if you’re sitting upright in a fixed-back chair. The extra angle also comes in useful when you’re sitting at a desk and want to combat screen reflections, or when you simply want to make the screen sit a little lower while you’re in a meeting. 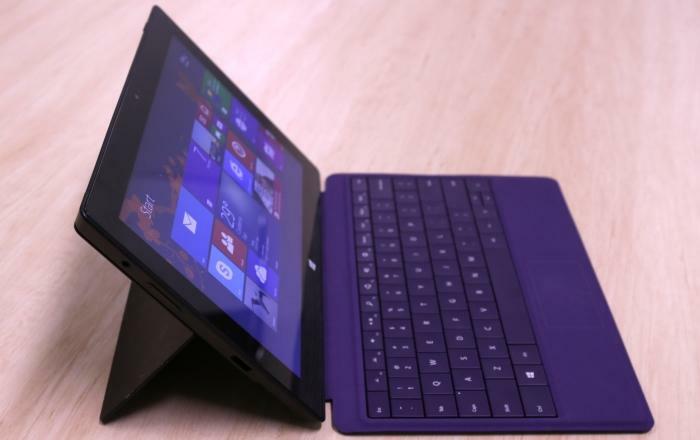 The Surface Pro 2's kickstand in action. This is the original angle. This is the extra angle that provides much-needed tilt for certain situations, such as when you're using it in your lap. The screen itself is one that we like overall, but we think that it’s too glossy. Reflections were noticeable during testing in our office environment, which required the brightness level to be turned up to full in order for the reflections to be less noticeable. This was okay since we were sitting near a power outlet, but if we were out and about it would have been a problem. Battery life in our rundown test, in which we disable power management, enable Wi-Fi, maximise screen brightness and loop an Xvid-encoded video, was 4hr 37min. General usage at medium brightness resulted in a time of almost 5hr, during which we performed tasks such as Web browsing, word processing (using Word), and listening to MP3s. It’s still a long way off all-day battery usage, but that’s to be expected considering it’s a regular computer in a tablet form factor. Charge time was well over two hours. As mentioned earlier, the screen has a Full HD, 1920x1080-pixel resolution, and on a 10.6in screen this resolution can look a little too small. For this reason the unit ships with the icons and text set to be larger than the native size — which also makes them easier to tap on with your fingers. We noticed that not all applications handled this setting well, with some text and graphics in Chrome, for example, looking blurry around the edges. If you have problems reading something on the screen, the magnifier tool that’s standard in Windows 8.1 is also a good option to consider, rather than making changes to the screen size overall, unless you want the extra size to make things easier to hit with your finger. The capacitive touch of the screen is accurate, and it can be used effectively for drawing and painting with the digitiser pen, which ships with the device and can sit in the power port when you aren't charging the tablet. When using just your fingers, it’s easy to navigate the Modern UI, and we had no problems at all with this aspect of the tablet's function. Side swipes, browsing through the app icons, flicking through open apps, and generally interacting with Modern UI-based apps was a great experience and one that we’ve been used to for a while now. With Windows 8.1, there are a couple of changes that have been made to the Modern UI, mainly concerning the layout and grouping of icons, the search results (which are now listed under the search bar rather than on the main screen), and the app switching flick gesture, which is disabled by default (a flick from the left side brings up the app switching panel by default). 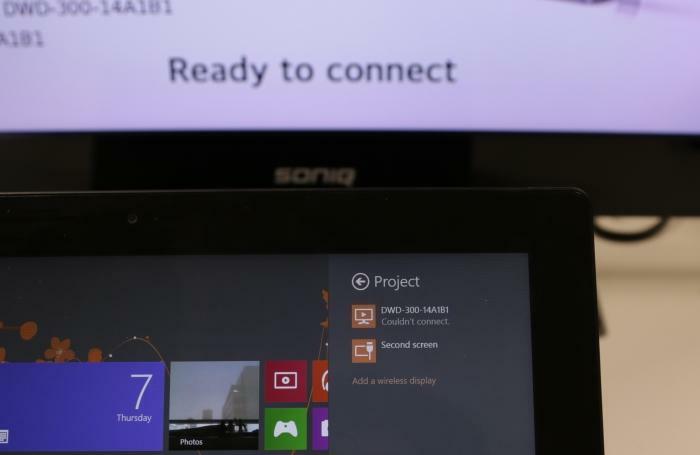 If you’re already used to the way Windows 8 works, you will have to adjust to a couple of these new changes. One thing’s for sure though, the Desktop isn’t any easier to use with the touchscreen in tablet mode. Unlike the Modern UI, where taps in a text box bring up the on-screen keyboard automatically, if you want to do any text input on a Desktop application, you will have to bring up the on-screen keyboard automatically and position the windows on the screen in such a way so that you can see what you’re typing. Using the Windows Desktop with touch is still something that can cause a lot of frustration because of this. When using the Surface Pro 2 as a tablet, we preferred to stay in the Modern UI environment as much as possible (especially when browsing the Web). The default actions of media files in Windows 8.1 still take you out of the Desktop most of the time, which can be annoying when all you want to do is preview a photo or launch a video or music file while still looking at your Desktop. You’ll have to change these default file associations, otherwise you’ll constantly end up switching between the Desktop and the Modern UI. What about the hardware design? We’ve already mentioned the kickstand, which now has two different angles for you to choose from. It’s a strong stand that’s made out of metal (as is the chassis), and we love its snapping action (and sound). The only other thing on the rear of the unit is an out-facing camera, which has a paltry 0.9-megapixel resolution. The front-facing camera isn’t much better, but it’s fine for Skype tasks. Just don’t use this tablet to take photos; not only will you look weird while doing so, the photos won’t be of a high quality. The edges have a small array of ports and slots that should keep most people happy: there is a USB 3.0 port on the left side, along with a headset jack, and physical volume controls (these controls are way too close to the headphone jack and can be somewhat awkward to manipulate when headphones are plugged in). Meanwhile, the right side has the power connector, a microSD card slot, and a video output. The video output port can be used with a VGA adapter dongle, or an HDMI adapter dongle, for which you’ll have to pay an extra $50 each. As an aside, the wireless adapter in the Surface Pro 2 is a Marvell AVASTAR 350N (802.11n, dual-band) that doesn’t support Intel Wireless Display (WiDi). It’s meant to support Miracast, though, and we tried it with an LG adapter that we had lying around. The Surface found the adapter, and it even connected to it, but we weren’t able to see the computer’s desktop on the TV. Our drivers were the latest as per the date of this review. The Wi-fi adapter supports Miracast. However, we couldn't get it to work with our LG DWD-300 adapter. It might just be an issue with our adapter. Unfortunately, we didn't have another type on hand to try this out. Update: If you want to use Miracast with the Surface Pro 2, we can vouch for the Actiontec ScreenBeam Pro, which worked fine for us under Windows 8.1 in our review of that adapter. We think one more USB port and a full-sized HDMI port should have been included on the tablet itself, just to make it easier to connect peripherals and storage at the same time, and to make it quicker and easier to connect this tablet to a TV or second display. We also would have liked a full-sized SD card slot instead of a micro slot, which would be more useful for transferring photos off a camera while travelling, for example. The microSD card slot is very handy if you want to add some semi-permanent storage to the Surface Pro 2, though, and we had no problems adding a 64GB Samsung microSD card. The extra space was much needed as the 64GB version of the Surface Pro 2 has a formatted capacity of 53.2GB, and we were left with just under 18GB of free space on the drive after installing 2GB worth of benchmarks and test files. That said, we’re thinking of the Surface Pro 2 as a regular laptop computer in this instance, and not as the device it really is, which is a tablet. If you do want extra ports and slots (as we do), then you can consider the Docking Station option, which has four USB ports (one USB 3.0 and three USB 2.0), 10/100 Ethernet, and a mini DisplayPort. It still doesn’t provide HDMI, and its Ethernet is slow. It doesn’t offer port expansion in a true sense because there is no dedicated docking facility on the tablet. Instead, it simply piggybacks off the original USB and display output ports on the tablet. However, if you absolutely need some extra ports when using the Surface Pro 2 on your desk, then this dock is the neatest option. After using the tablet for a long while for the most basic of tasks (Web browsing while listening to MP3s), the rear did get a little warm. Not so warm that it couldn’t be held, but sufficiently warm enough for us to notice. It gets a lot warmer when the CPU has to do plenty of work, and this means things like watching lots of YouTube videos could make the device a little uncomfortable to hold. There are two fans in the tablet that extract warm air through tiny vent holes at the top of the unit, and they aren’t annoyingly loud (though you will notice them in a quiet room). Incidentally, there are also speakers near the vent holes, and they also aren’t very loud. If you want to enjoy audio from this tablet, then headphones or a Bluetooth speaker are needed. 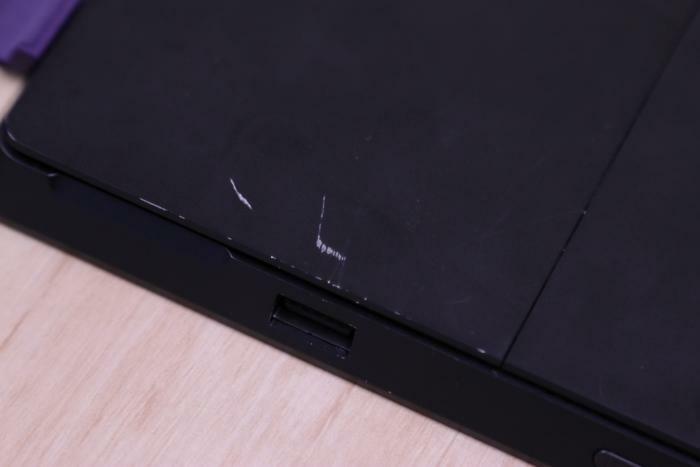 One thing that we absolutely hate about the Surface Pro 2 is just how easily it can get scratched. The first lot of scratches we noticed were caused by us just carrying the tablet around in our backpack with its power supply, which is a small brick of 93x49x28mm (LxWxH) with a two-pronged cord that’s quite short (about 480mm). The tablet rubbed against some other gear in our bag, and scratches that exposed the metal underneath became plainly obvious on the rear of the kickstand. However, what’s more problematic is the scratching that was noticeable on the edge of the kickstand. It seems to have been caused from our repositioning actions while using the tablet on our desk (going from one angle to the next and back again). Basically, you have to be careful to not drag the tablet on a desk, otherwise the paint will get damaged. These scratches are mostly a result of the unit moving around in our backpack. Make sure you use a protective cover when transporting the Surface Pro 2 so that this doesn't happen to you. Another area that got scratched was the power port. The act of inserting and removing the charging cable caused the paint to be removed from the edges around the port. On a brand new device, it took about a week before the scratches became obvious, and it was a little disconcerting. At this point we should note that we’re not fans of the power connector. Its rectangular shape, and the way the cable sticks out of one end really make it awkward to insert quickly. Furthermore, there were instances when we moved the tablet while it was charging, and we didn’t notice that the cable had come apart from the unit — not until we noticed that the battery power was lower than before we’d started charging. This was more a case of wear and tear. You can see that the paint has come off the edges where the plug fits into the connector. 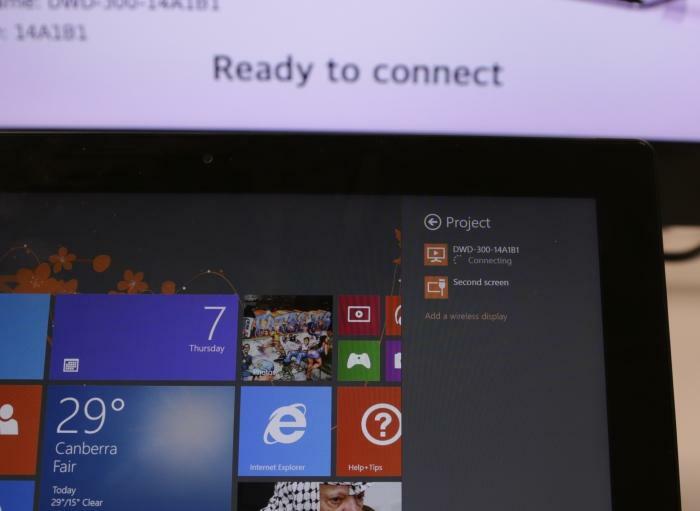 There’s no doubt the Surface Pro 2 is a great tablet and a potential laptop replacement. It has good speed, a high definition display, good hardware features such as the kickstand and the Type Cover 2 option, and it also isn’t overly expensive for what it is. But there are a few shortcomings that we think should make anyone think twice before purchasing. The interface is the primary concern here, especially if you plan on using the Desktop a lot with the touchscreen. Some things that were annoyances in the first version of Windows 8 still haven’t been fixed in 8.1 — things like file associations and on-screen keyboard behaviour. The battery life is a little too short for our liking at between four and five hours for typical usage, and it also takes more than two hours to fully charge, which is a long time for a tablet device. We found that the paint came off too easily after only one week of use, and not just due to our negligence, but also due to the design. And, of course, we don’t think there are enough USB ports, and we wish that it also had full-sized versions of the display and SD card facilities. Its Wi-Fi could also be better (think 802.11ac). Apart from these things, though, the Surface Pro 2 makes a good case as being one of the best ‘hybrid’ ultraportable computing offerings on the market when you consider the optional Type Cover 2, and, in our opinion, if you do want this tablet then that cover is a must-have accessory. All up, we really like the Surface Pro 2, and we’re impressed with the fact that we were able to use it reliably for a lot of our typical work tasks and everyday computing habits. It’s not just a tablet but an actual computer in a tablet’s body. 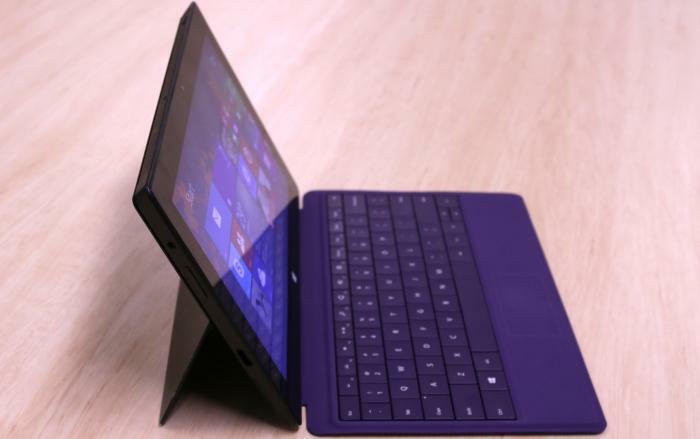 Can’t get enough of the Surface Pro 2? 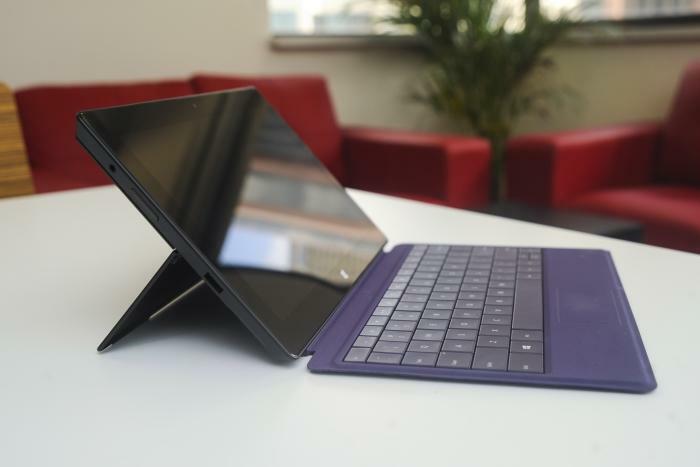 Read more about it in our New Zealand PC World review: Surface Pro 2 review.